Find a modern city oasis in the heart of Pittsburgh at The Westin Pittsburgh. 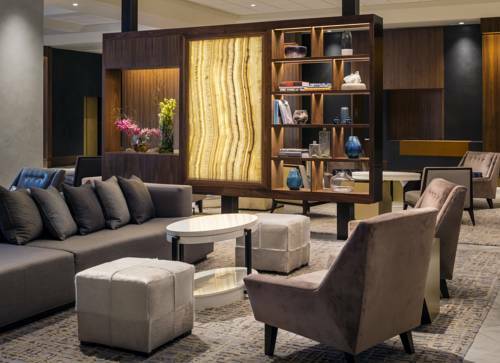 Brimming with smart style and sophistication, our hotel provides travelers with all the tools they need to enjoy a relaxing and productive stay in the Steel City. It begins with our impeccable downtown location; ideal for business guests, the David L. Lawrence Convention Center is directly connected to our hotel, while nearby attractions like PNC Park and Heinz Field are only moments away. Retreat into our spacious, modern guestrooms, all of which feature intuitive details like complimentary high-speed Wi-Fi. Modern comfort food and award-winning burgers are on the menu at Bill's Bar and Burger, while Penn City Grille showcases vibrant, nourishing breakfasts. Find your balance in our WestinWORKOUT Fitness Studio. Our hotel, a leading event destination in Pittsburgh, also encompasses over 42,000 square feet of collaborative meeting space. Penn City Grille: Begin your morning in downtown Pittsburgh at Penn City Grille, our signature breakfast restaurant. Sample nourishing fare from our SuperFoodsRx Menu and kick-start your day with a healthy, nutrient-rich meal. Bill's Bar & Burger: Renowned for its mouthwatering burgers, Bill s Bar and Burger began in New York City in 2009. Burger aficionados and casual diners alike visiting the heart of Pittsburgh can enjoy classic comfort food served in a convivial atmosphere. Room Service: Enjoy restaurant-quality cuisine crafted from wholesome ingredients any time of day with our 24-hour in-room dining service. Starbuck's: Energize with your favorite coffee beverage, savory pastry or light bite at our lobby Starbucks . Open Monday-Saturday 6AM - 6PM and Sunday 7AM - 2PM, it's the perfect place to reboot in downtown Pittsburgh.